Real estate agents come from all different backgrounds and ages. The National Association of Realtors® (NAR) finds that 95 percent of agents chose a career in real estate after leaving one or two previous careers—usually in business, finance, or management. Regardless of your background, you have to become licensed if you want to be a real estate agent. Here are some of the most common real estate education questions—and answers. Years ago, you would have had to attend real estate pre-licensing or continuing education school in a brick-and-mortar location. Today, many licensing agencies and real estate schools offer their programs completely online. Do you prefer classroom learning and interaction with a teacher? Or do you prefer studying at your own pace from the comfort of your living room? What role does education play in my real estate career? Real estate pre-licensing education: Required courses to obtain your real estate license. Real estate post-licensing education: The courses many states require you to complete after you obtain your real estate license. There is generally a timeframe from 6 to 12 months after you become licensed in which you must complete post-licensing requirements. Real estate continuing education: Each state requires you to complete a certain number of continuing education hours in order to renew your real estate license. The duration of your license, and the credit hours you must take, vary from state to state. However, most states require license renewal every two years. Bear in mind that continuing education is a great way to stay up to date on changes in the real estate industry. Real estate professional development: From taking specialization and designation courses to attending online webinars or seminars on topics of interest, professional development education is not required by your state, but gives you the opportunity to learn more about different areas of real estate. It helps you set yourself apart from your peers. ARELLO is the leading real estate training organization, made up of industry professional from around the world. Schools with the ARELLO seal have been certified by the foremost governing body with administrative and enforcement authority over real estate licensing and regulations throughout the country. A school that bears the ARELLO seal, such as Real Estate Express, has undergone strict scrutiny to qualify as an accredited real estate school. Look for this seal when choosing a school. How much does a real estate education cost? 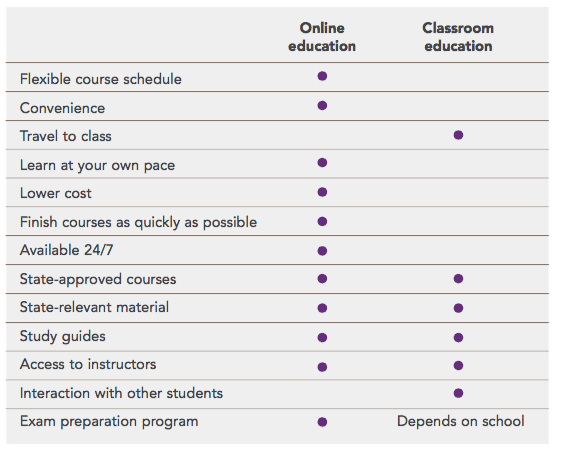 What is the online course experience like at Real Estate Express? Take a sneak peek inside our course functionality in our video below. To find out more about education requirements for your career as a real estate agent, download our free guide: Is a Real Estate Career Right for You?